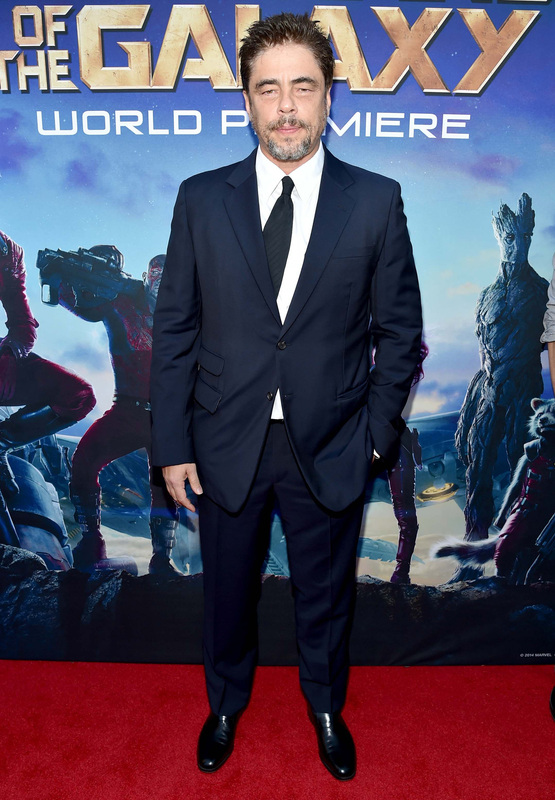 HOLLYWOOD—“Guardians of the Galaxy” director James Gunn can’t say enough nice things about Benicio Del Toro, who plays Taneleer Tivan a.k.a. 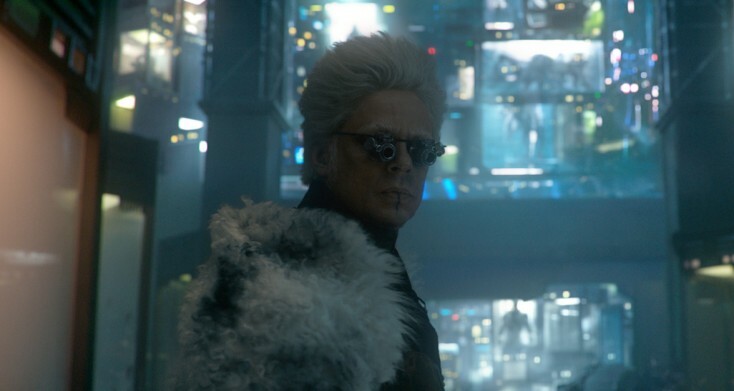 The Collector, one of the bizarre characters five superheroes, led by a human named Peter Quill, encounter during their quest to save a planet from destruction. That convinced Gunn that he had the right actor for the role. With a striking white pompadour, 80’s pop star makeup and garish robes, Del Toro’s flamboyant Collector manages to stand out among a field of strange-looking aliens that inhabit the action-packed adventure based on the popular Marvel comic books. An Oscar winner for his supporting role in Steven Soderbergh’s “Traffic,” Del Toro plays the keeper of the galaxy’s largest collection of fauna, relics and species in his high-security storage facility. He reveals to Chris Pratt’s Peter Quill a.k.a Star-Lord and Zoe Saldana’s alien Gamora the value of the orb that has fallen into their possession, but his greed gets the better of him and he immediately tries to forcibly take it from them. The 47-year-old Puerto Rico native recently spoke about playing the knowledgeable yet eccentric and dangerous character, and being given the opportunity by Gunn to explore it and make it his own. Q: You’ve played obviously a lot of great characters over the years from the Wolfman to Che Guevara, but The Collector’s kind of an unusual one. It’s like nothing else you’ve ever played, right? Del Toro: Right. Well, the hair for sure. (He laughs.) As I go about it, James kind of made me feel like I could explore it. I got there and I worked with four actors, and two of them weren’t actually there. (Vin Diesel’s Groot and Bradley Cooper’s Rocket were computer-generated.) So I had a lot of fun with Chris (Pratt) and Zoe (Saldana). What I do remember was I felt like I could explore the character in every way I would have wanted to. James (Gunn) was very supportive to taking chances and trying different things. I felt like an animal that grows up in a cage and suddenly you open the door and he comes out and he’s tentative to take chances. James was very, very nice to me to allow me to like go, go, go, go, go. At the end, I was like, “Oh. I could have done this. I could have done that,” and yet it was a great feeling. Q: You’re coming into a new universe, the Marvel universe. What is the appeal of the Marvel universe and particularly this “Guardians of the Galaxy” offshoot? Del Toro: I’ve done a lot of movies. You can do a movie you think is great and then you see it and it doesn’t work. You never know. But this is something that is the opposite. This is a movie where I loved working with everyone, and then the final product was like a great movie that I really enjoyed. I saw myself as the character of Chris (the hero) even though I’m The Collector. I got pulled in and I think the credit is to everyone involved and James because he just really did an emotional thing. I told James he hit me on every sense. I even felt hungry (watching) the movie even though no one eats. I mean all the senses were tapped and I really enjoyed it. Q: The songs in the movie have important significance to the story. They are a mix of ‘60s and ‘70s pop and rock songs. Did you have a favorite? Del Toro: There’s a Bowie tune there. What is it? Del Toro: Yeah. I like that one! I think The Collector is introduced with that one.